Hannah Katsman grew up in Cincinnati, Ohio, USA, and earned a BA from Barnard College and an MA in education from Hunter College. She moved to Israel in 1990 with her husband and 6-month-old son. After a poor experience breastfeeding her oldest, and a much better one after the birth of her second son only 18 months later, she began answering breastfeeding questions from mothers in the neighborhood. In 1999 she became a La Leche League Leader, and has worked as an IBCLC in private practice since 2011. At her popular website, A Mother in Israel, she writes social commentary on breastfeeding, parenting, Judaism, and women’s issues. Her second website, Cooking Manager, is about healthy and efficient home cooking and also grew out of her work supporting young families. 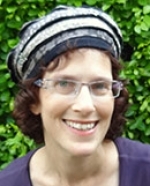 She lives in Petach Tikva with her husband and six children, aged 9-23, and serves as Area Coordinator of Leaders for LLL Israel.